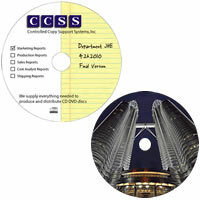 Custom Printed DVD Media : CD/DVD Supplies & Services, CCSS Inc. This year why not give a personalized gift to your friends and family. A custom printed DVD-R with your own artwork, or have us create it for you at no additional charge. That's a $50.00 value! Now you will be able to copy your videos, pictures and other information to these DVDs making a personalized gift that will be cherished by your family and friends for a lifetime. This package includes 10 4.7gb DVD-R with custom printed art in a clear c-shell.